This month marks the thirtieth anniversary of the first full transit of Canada’s Northwest Passage by a commercial vessel, when the Lindblad Explorer arrived in Yokohama in September 1984. The 43-day voyage had left St John’s NL in August. But things are now accelerating in the Northwest Passage. Last year saw the first commercial cargo, 73,000 tons of coal, move from Vancouver to Finland, and this year the first westbound cargo, 25,000 tons of nickel concentrate, will move from Quebec to China. In 2015, Abercrombie & Kent will become the seventh company operating expedition ships through the Northwest Passage, and in 2016 Crystal Cruises will carry 900 passengers from Seward, Alaska, to New York in its 68,870-ton Crystal Serenity. With all the recent activity in the area it is easy to forget that this month actually marks the thirtieth anniversary of the first transit of the full Northwest Passage by a commercial passenger vessel. On August 20, 1984, the 2,398-ton 104-berth Lindblad Explorer left St John’s, Newfoundland, bound for a 43-day voyage through the Northwest Passage that would take her to Yokohama on September 29, thus becoming the first such ship to transit the Northwest Passage. 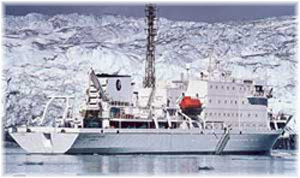 In 1985, the 3,153-ton 138-berth World Discoverer followed, becoming the first ship to transit the Northwest Passage in the opposite direction, when she completed a 32-day 6,295-mile voyage from Nome to Halifax for Society Expeditions. Although the game that started thirty years ago has seen ships passing every year since, it is only in recent years that this trade has grown significantly. But the passage is not without risk. Occasionally, even as late as this summer, ships have had to turn back without completing the whole Northwest Passage. In 1986, the World Discoverer, trying to repeat her success of the previous year, on a 31-day voyage between Greenland and Dutch Harbor in the Aleutians, had to turn back. Unexpectedly low temperatures during most of the year had created a significant amount of ice throughout the Eastern Arctic. Although she was assisted by a Canadian Coast Guard icebreaker, the ice was too heavy. Having to turn back in Peel Sound, she had at least managed to reach the western end of Bellot Strait, within the Northwest Passage. In September 1991, impenetrable ice prevented the 164-berth Frontier Spirit (now sailing as the Bremen) from completing an eastbound voyage. The ship, chartered by Salen Lindblad Cruising, had to turn back at Point Barrow, 1,000 miles from Dutch Harbor, where she had begun. On board were 126 passengers. The ice was so heavy that year that even a Canadian Coast Guard icebreaker could not get through. As a result, she headed for Vancouver instead of St John’s and two East Coast cruises had to be cancelled. There are also other hazards. In 2010, CCGS Amundsen had to evacuate 128 passengers from the Clipper Adventurer (today’s Sea Adventurer), which was operating under charter to Adventure Canada when she hit an uncharted rock shelf in Coronation Gulf near Kugluktuk. CCGS Sir Wilfrid Laurier then took over for the refloating operation. But generally, the story of the Northwest Passage has been one of progress. In the summer of 2010, for example, both of Hapag-Lloyd’s expedition ships, the 6,752-ton 164-berth Bremen and the 8,378-ton 184-berth Hanseatic, transited the full Northwest Passage, with one ship travelling in each direction. While the Bremen travelled from Nome to Reykjavik, the Hanseatic sailed from Kangerlussuaq, Greenland, to Nome. During their crossings, the two ships managed to rendezvous near Cambridge Bay. In 2012, another operator, Canadian-based One Ocean Expeditions, began to offer a double transit of the Northwest Passage with its 6,450-ton 96-berth Akademik Ioffe coming in from the Atlantic and turning around at Kugluktuk, formerly Coppermine, near the western end of the passage, and returning again to the Atlantic. One Ocean offered two 14-night transits of the Northwest Passage, with a departure from Kangerlussuaq, sailing west to Kugluktuk, and another in the reverse direction from Kugluktuk. Similarly, Adventure Canada, founded in 1987 and now incorporating Cruise North Expeditions, has been offering one-way cruises from and to the Atlantic with its 4,376-ton 118-berth Sea Adventurer for some years now. 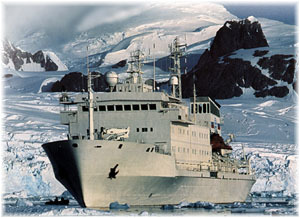 Between 1992 and 2011, the chartered 12,288-ton 120-berth Russian icebreaker Kapitan Khlebnikov had also offered transits of the Northwest Passage for Quark Expeditions and Marine Expeditions. The year 2012 also saw the biggest ship of any kind to date in the 43,524-ton 165-residence condominium ship The World, which made a full Northwest Passage voyage from Nome to Nuuk, Greenland, with about 200 passengers and a crew of 260. The World, which bills itself as the largest privately owned residential yacht on earth, stopped at either end of the Passage, in Cambridge Bay August 30 and in Pond Inlet on September 5. During 2012, twenty-one yachts also transited the Northwest Passage, including Paul Allen’s 9,932-ton mega yacht Octopus, which has since made a second crossing. In 2013, for the first time, three ships did the full Northwest Passage, one voyage each being made by Hapag-Lloyd Cruises’ Bremen and Hanseatic, travelling in opposite directions, and a first-time transit by Ponant’s 264-berth 10,944-ton Le Soléal, which limits herself to 199 passengers for these voyages. Also last year, the Danish bulk carrier Nordic Orion became the first commercial cargo ship to traverse the Northwest Passage, with a cargo of 73,000 tons coal loaded in Vancouver and bound for Finland. This route saved her 1,000 miles and allowed her to load 25% more cargo than she could normally carry through the Panama Canal. 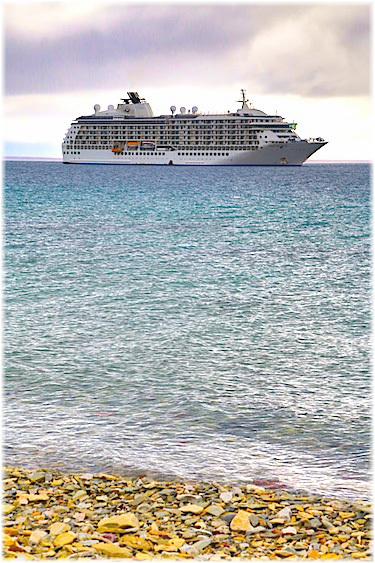 This year, Silversea Expeditions completed its own first crossing, with the 6,072-ton 132-berth Silver Explorer arriving at Nome on September 1. For Silversea, relatively new to expedition cruising, this is a first-time involvement in the Northwest Passage. Another cargo ship will set a record this autumn when the Canadian-owned Nunavik carries 25,000 tons of nickel concentrates from Deception Bay, in Arctic Quebec, to China. This will not only be the first east to west commercial cargo, but it will be the first such cargo actually to originate in the Arctic. As 2014 was the 70th Anniversary of the west to east crossing by the RCMP patrol vessel St Roch, One Ocean Expeditions offered a shorter transit this year that could be done in about two weeks by sailing between Iqaluit, on Baffin Island, and Cambridge Bay at the western end of the passage. Using the Akademik Ioffe between Cambridge Bay and Iqaluit, this 12-night voyage was to depart August 25, retracing the route followed by the St Roch in 1944 under command of Henry Larsen. On board for the occasion was Larsen’s granddaughter, Doreen Larsen Riedel. In the event, however, this year saw the severest ice conditions in the Canadian Arctic for several years and the Akademik Ioffe had to depart from Resolute instead of Cambridge Bay. Nevertheless, she had a most successful cruise to Iqaluit with what turned out to be an interesting itinerary with multiple sightings of whales and wildlife and a ship full of happy passengers despite the changes. The first ever transit of Canada’s Northwest Passage was made in 1903-1906 by the great Roald Amundsen of Norway. This feat was not repeated until 1940-42 when the RCMP St Roch sailed west to east. In 1944, Larsen undertook an east to west transit in the same season, marking the first-ever single season crossing of the Northwest Passage and making the St Roch the first vessel to complete the route in both directions. Also this year, One Ocean was able to offer limited space on its 6,344-ton 96-berth Akademik Sergey Vavilov for a special cruise in search of Sir John Franklin’s HMS Erebus and HMS Terror, which were lost in the Arctic along with their 128 men in a mid-19th Century quest to find the Northwest Passage to the Orient. Not only that, but after being missing for 168 years, this year’s expedition actually managed to find one of Franklin’s ships, although it is not known just yet which one. This discovery alone is bound to lead to more interest in Arctic tourism and the Northwest Passage that Franklin was in search of. Of this year’s full transits, Ponant’s 10,944-ton 264-berth L’Austral arrived in Anadyr just last week, having left Kangerlussuaq on August 26. Originally, she was scheduled to sail to Nome but the disembarkation port was changed to Anadyr some months ago. Meanwhile, Hapag-Lloyd’s Hanseatic was absent from the Northwest Passage this year, as she was completing the first transit by a foreign passenger ship of Russia’s Northern Searoute, sailing westbound from Nome to Bodo in Norway. 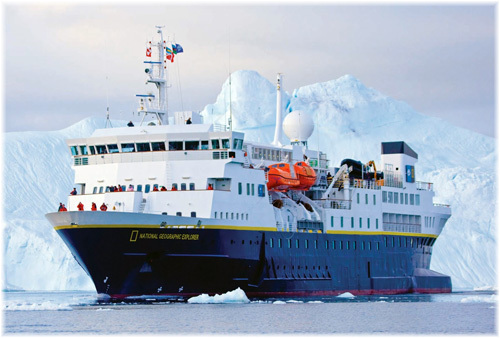 But after an absence of many years, Lindblad Expeditions was back this year, sending its 6,471-ton 148-berth National Geographic Explorer from Reykjavik for Kugluktuk. Like One Ocean and Adventure Canada, Lindblad offered one passage each way, in from the Atlantic and back out to the Atlantic. 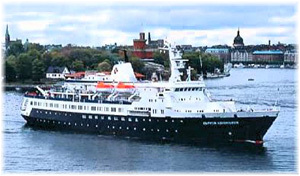 The 25-day voyage that departed Reykjavik on July 28 was meant to finish in Kugluktuk, but as with the World Discoverer in 1986, even with the assistance of a Canadian icebreaker, the Explorer became beset by heavy ice in Peel Sound and had to give up the rest of her Northwest Passage transit. Instead of changing passengers at Kugluktuk, the new Explorer ended up going to Resolute instead, where there was an airport capable of handling her passengers. The second 24-day eastbound Northwest Passage itinerary, which included Newfoundland and Labrador, then ended up sailing from Resolute, near the Atlantic entry to the Northwest Passage, instead of Kugluktuk, at the other end. 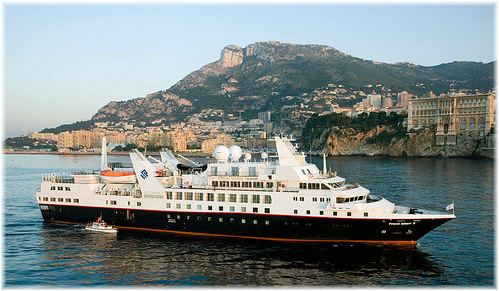 In 2015, in another first, Abercrombie & Kent will charter Ponant’s Le Boréal for a full transit from Kangerlussuaq to Anadyr, leaving on August 21. A&K will thus become the fourth operator to offer the full passage between Atlantic and Pacific, joining Hapag-Lloyd Cruises, Silversea and Ponant themselves. 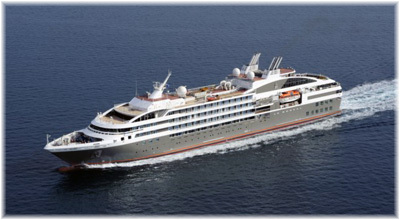 It will also mark the first time two ships from the same company will make the transit as Ponant is scheduling its own Le Soléal for a second voyage from Kangerlussuaq to Anadyr, leaving Greenland on August 24. One Ocean Expeditions, Adventure Canada and Lindblad will also offer one-way passages from and to the Atlantic Ocean. Next year, Adventure Canada will replace the Sea Adventure, which suffered from mechanical problems this year, with the 12,907-ton 198-berth Ocean Endeavour. But the big news remains Crystal Cruises’ plans to send the 68,870-ton Crystal Serenity from Seward, Alaska, to New York via the Northwest Passage in 2016. Although she can carry 1,090 passengers, she will be limited to 900 for this passage. The Crystal Serenity, like The World that preceded her, has been built to the Finnish Ice Class 1C. The voyage, which calls for her to leave Seward on August 16, has been in the planning for two years and if all goes well will see her arriving into New York on Saturday, September 16, 2016. As we said a few weeks ago, with the discovery of one of Franklin’s long-lost exploration ships and the presence now of seven ship operating expedition companies, as well as increasing cargo activity, watch for the Arctic to become an interesting space for cruising in future years. The new Finnish shipyard company Meyer Turku came into operation on Friday, coinciding with news that options had been placed with the yard by TUI Cruises for two more ships in the present Mein Schiff 3 series. 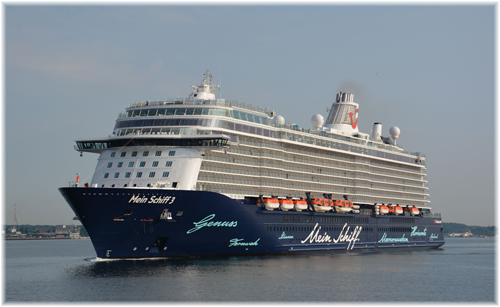 To be named Mein Schiff 7 and Mein Schiff 8, if the orders are indeed confirmed they would be for delivery in 2018 and 2019. Although only speculation at this stage, this does make it seem more likely that eventually the two ex-Celebrity ships Mein Schiff 1 (built as Galaxy) and Mien Schiff 2 (built as Mercury) could eventually join their sistership Century in China. However, if one were to judge by the growth over at AIDA Cruises, it could well be that all eight ships will be needed by TUI. One last name, Vantage of the Seas, previously applied for in 2012, was dropped. At the same time, it was announced that the third Quantum class ship would be named Ovation of the Seas. It seems from these various applications that Royal Caribbean does not intend to repeat any names, unlike say Princess Cruises, who have now used some of their names, such as Royal Princess, for the third time.